This product requires the base game Valhalla Hills. Please note if you already own Valhalla Hills: Two-Horned Helmet Edition this DLC will be added to your game on release day. 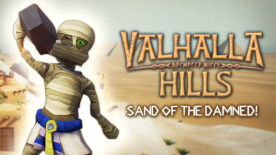 In the first DLC of the Viking adventure Valhalla Hills, our valiant heroes brave the harshness of desert survival. Scorpions and mummies are not the only challenges on the road to Valhalla, though. The earth itself will make life difficult, as it lies barren and dry without irrigation. Valhalla Hills is required to play this DLC.